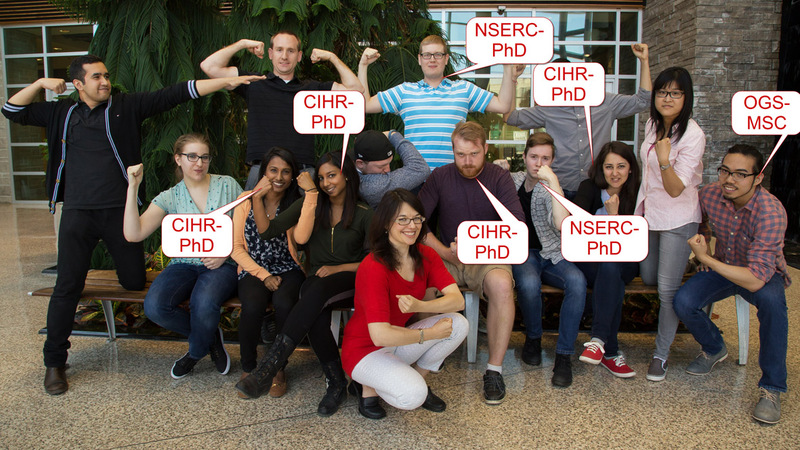 The Bowdish lab is the strongest lab at McMaster and we have the scholarship winners to prove it! Who’s got the strongest lab at McMaster? I do! We’ve had a great run of success at the Bowdish lab with fully all of our students receiving prestigious scholarships! And that’s not to mention our other successes such as our summer scholarship winners (Jason Fan – IIDR), our students who got their degree and moved on to great things (Dr. Fan Fei – manager of Mass Spec facility, Dr. Mike Dorrington – PDF at the NIH), and our PDF, Dr. Chris Verschoor who got a faculty position! Bowdish lab scholarship winners 2015/2016: Netusha Thevaranjan (CIHR-PhD), Avee Naidoo (CIHR-PhD), Kyle Novakowski (NSERC-PhD), Pat Schenck (CIHR-PhD), Dessi Loukov (CIHR-PhD), Justin Boyle (NSERC-MSC). This entry was posted in News and tagged alumni update, CIHR, fellowship, graduate students, PhD, post-doc, scholarship, student, success!, summer student, thesis student, undergraduate by Dr. Dawn M. E. Bowdish. Bookmark the permalink.